What is that peanut guy? Golf is a very deceptive sport. While many people will bemoan how "boring" it is, they're only looking at it from the viewpoint of a spectator. Actually picking up a club and swinging at a ball will show you just how much technique goes into perfecting your shot. You need to understand the weight of your gear, the arc of your shots, the wind resistance of the course, and account for the shapes of the greens. It can sometimes feel like a giant puzzle. That's what makes a game like Golf Peaks feel so natural. This is an idea so obvious, it's a real surprise it hasn't happened before. 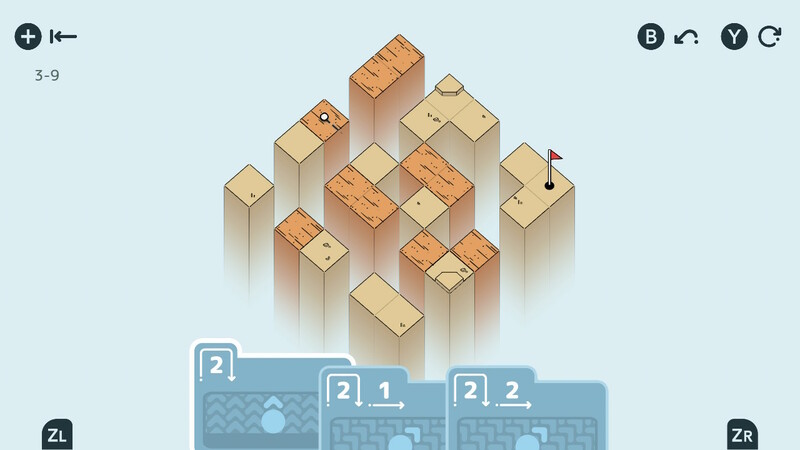 Golf requires careful thought and planning, so why not mix that with a puzzle game? While you might be losing all of the club selection and execution of technique, what you're gaining is a title that captures the essence of golf in bite-sized chunks that anyone can dig into. Explaining Golf Peaks is actually quite a bit harder than simply playing it. 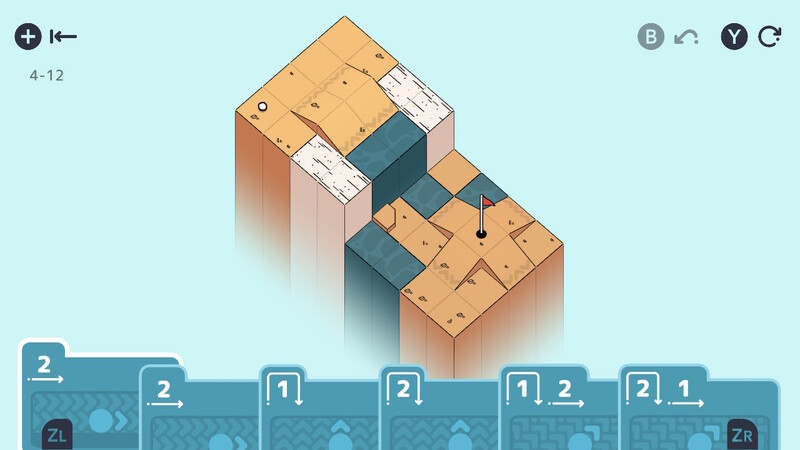 It's a mixture of the aesthetics of golf with a card-based puzzle platformer. Levels introduce concepts that get iterated on for multiple levels before culminating in a final challenge. Each world (there are nine) focuses on something new and constantly tasks your mind with figuring out which shots you need to reach the hole. The shots you have available are pre-determined on each hole, so you can't simply shoot your ball straight at the goal. You'll need to carefully assess the grounds, make sure you're compensating for obstacles, and ensure your final shot won't overshoot the hole. It perfectly encapsulates the various parameters that go into every shot of golf while focusing more on level design instead of skill execution. Being set in a fictional environment allows Golf Peaks the opportunity to create some bizarre greens. Everything is placed on a grid system, but you'll see various slopes, water hazards, jump pads, boost pads, and tiered platforms. These aren't the flat plains of real golf, but more like something you'd see in a Mario title. The isometric viewpoint does limit the possibilities a little, but it also doesn't obscure obstacles from your view. On the Switch port, you control the game with the Joy-Con or via the touch screen. Since Golf Peaks was originally a mobile game, it only makes sense that the original control scheme would be carried over. 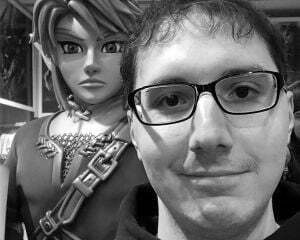 You can’t detach the Joy-Con and play in portrait mode, but you are given docked play. The physical controls work perfectly fine and it's nice to have a massive view of the playing field. You can call a friend over if you get stumped, which is certainly useful. As for how the game progresses, it is basically the Jonathan Blow formula set forth by Braid. Worlds don't radically alter the controls, but you'll have to contend with different variables on each hole. The theme of each area changes, and it blends with the concept that's spotlighted. For instance, an ice world has a blue color scheme. It makes the levels feel distinct and has a natural difficulty curve that is mostly well-executed. For some reason, World Seven is the hardest, yet there are still a bunch of levels after the game maxes its difficulty out. Once you finish the main nine levels presented in each world, the game will seamlessly push you onto the next world. If you back out to the menu, you'll find three bonus challenges that sometimes mix later concepts into the current level. There isn't some stipulation to unlocking these levels apart from completing the current world, which does feel like a missed opportunity for bonus content. What I mean is that some of the holes have multiple solutions to them. While there is clearly one path the developers meant for you to take, you can occasionally complete courses in fewer shots than you're allotted. I'm convinced that all these options are intentional misdirection on some levels, but I've also replayed levels where I've not utilized each option and managed to finish them while burning through pointless shots. I feel there could have been a better reward for finding the most efficient path through a level, which would make replaying individual holes feel more rewarding. That’s really my only complaint, tthough. There are 109 levels (one is a bonus in the credits) and figuring out how to finish them doesn't take that long. I’m not saying there needs to be 100 more or anything, but locking those bonus levels behind alternate paths would have given players a reason to revisit levels and perfect their game, much like real golfers. I suppose the mobile roots of this game explains why the levels are so small and easily digestible. This was something meant to be played in quick spurts instead of plowed through in a single sitting. It's not like you'll be missing out on anything by doing so, but I'm not sure the Switch is the best platform for Golf Peaks. It does retain that portability factor, but it also costs a few dollars more than its mobile counterpart. Still, $5 for a solid puzzle game with an interesting spin on golf is hardly what I'd call a bad deal. 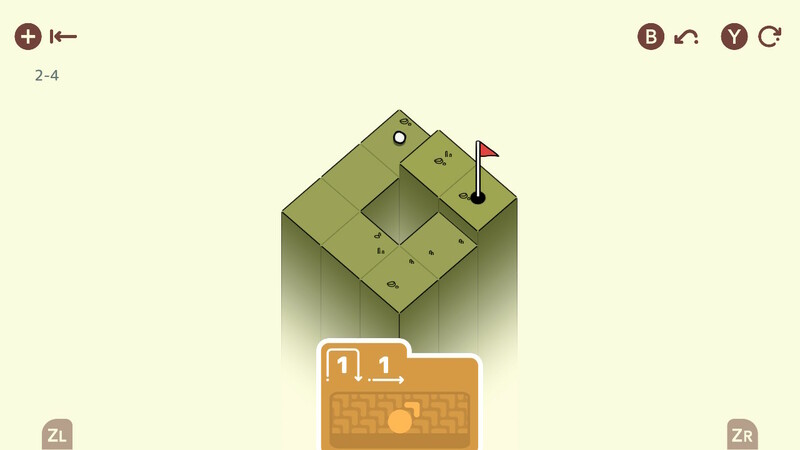 Unless you simply do not enjoy puzzle games, you're bound to have some degree of fun with Golf Peaks. Being a fan of golf will help, but anyone with a penchant for working through various puzzles will have a good time here. Now I just wish I understood what that weird nut thing from the promotional materials is. Is he a golf caddie or Mr. Peanut's hippie cousin?